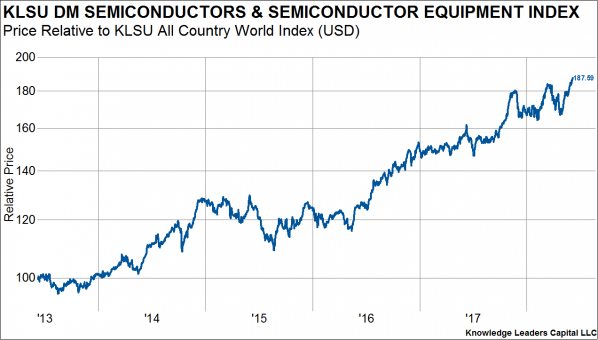 Semiconductor and semiconductor capital equipment stocks have been stellar performers lately, a trend we have been a bit slow to recognize. 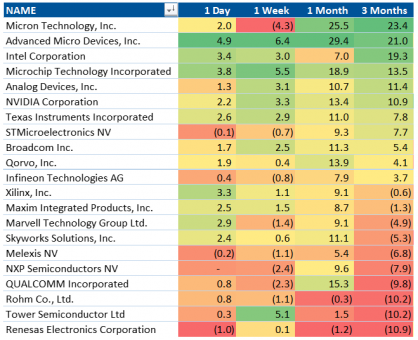 So, I decided to do a deep dive on semis and semiconductor capital equipment stocks to see if there is opportunity left to capture. 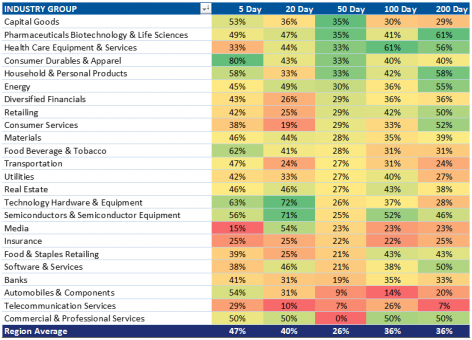 Indeed, when I combine the developed and emerging market industry groups of mid/large cap stocks, the best performer over the last three months is the semi/semi-cap equipment industry. 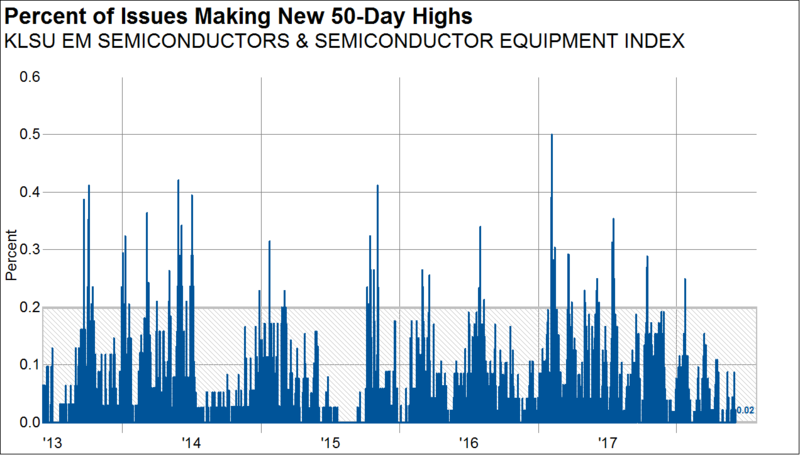 Especially in the developed markets, semis have been on a tear, hitting new five-year relative highs compared to global stocks. 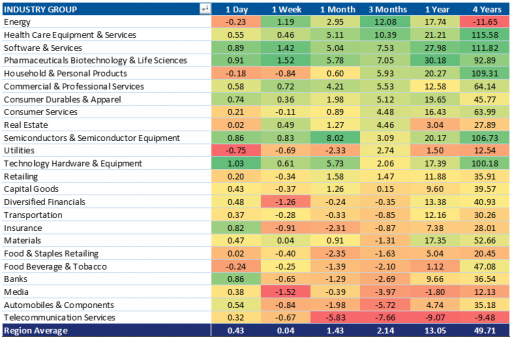 Semi/semi-cap equipment stocks are the best performing industry group, up over 10% in the last three months. In the emerging markets, semi/semi-cap equipment is the second best performing industry (only behind technology hardware), up over 4% in the last three months. 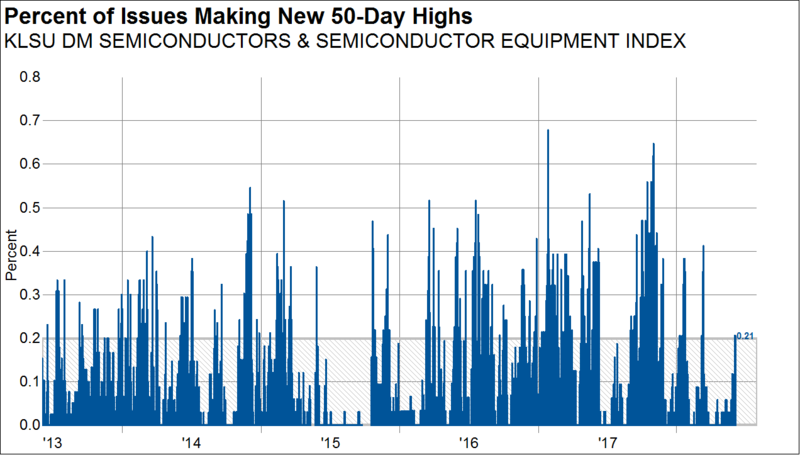 While relative performance made new highs earlier in the year, the trend has given way lately as pessimism has overcome the emerging markets. One of the confirming signals I look for when assessing the durability of group move is breadth, and here some non-confirmations start to appear. Over the last fifty days, only 47% of the DM semi/semi-cap equipment stocks have outperformed the MSCI All Country World Index. Still looking at the developed markets, breadth has experienced a sequence of lower highs and lower lows since last fall. 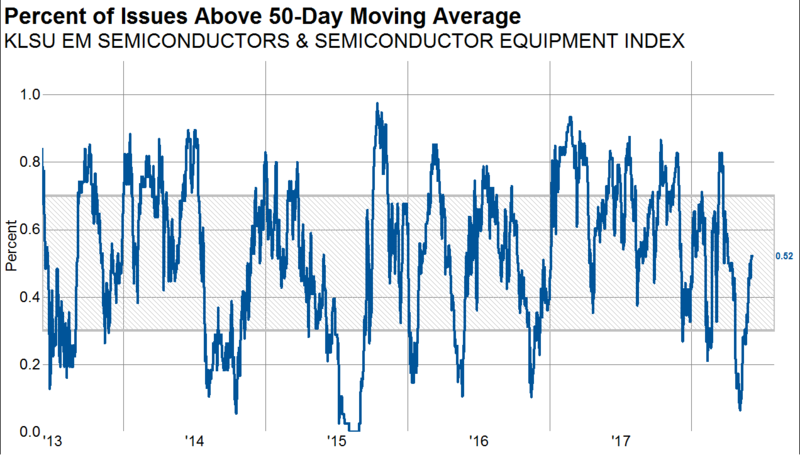 Here I show the percent of stocks above the 50-day moving average. Often these breadth divergences are a result of large cap stocks outperforming smaller cap stocks, but in this case, that doesn’t seem to be the explanation. 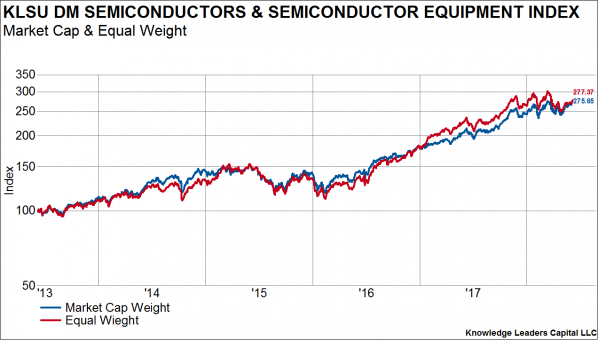 The equal weight and market-cap weight indexes have performed almost identically over the last five years. Finally, the thrust from the semi/semi-cap equipment group has been somewhat muted. 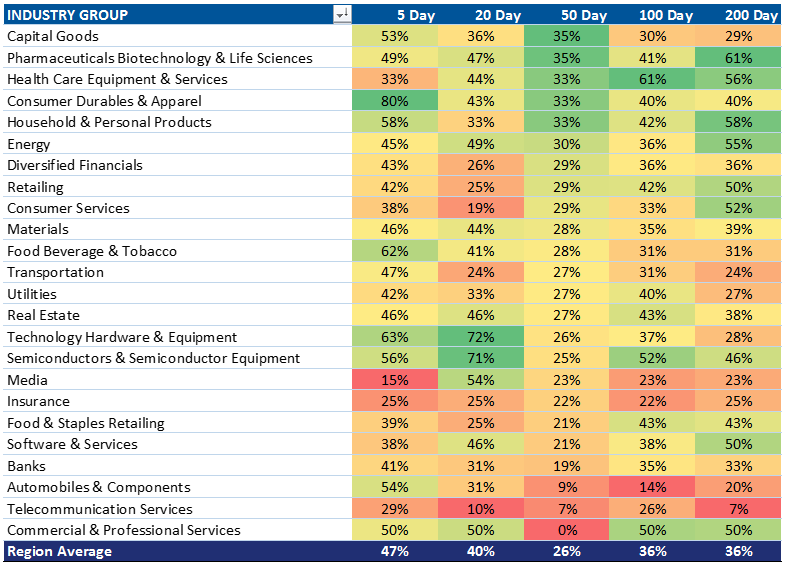 It is a non-confirmation when the best performing industry group only has 21% of its members making new 50-day highs. Last fall over 60% of members were making new 50-day highs. 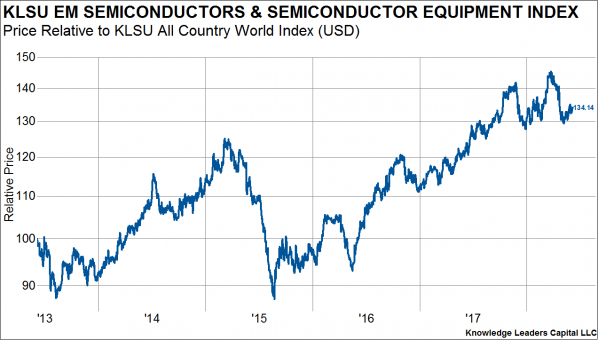 Turning to the emerging markets, the results have been somewhat worse, with only 25% of semi/semi-cap equipment stocks outperforming the MSCI All Country World Index over the last 50-days. 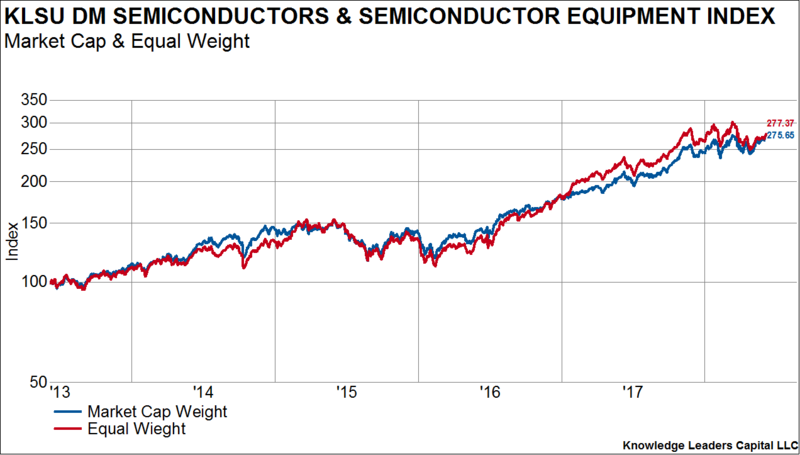 Helping explain the weak breadth, next I show the performance of EM semi/semi-cap equipment stocks on an equal weight and market-cap weight basis. 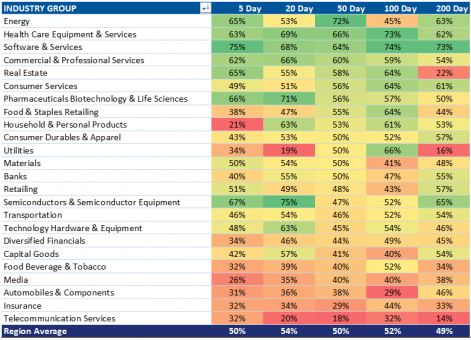 Here, the largest stocks have performed considerably better than the mid-caps. 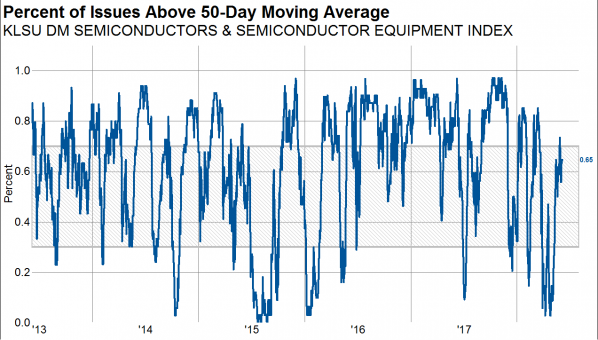 We’ve seen the same deterioration in breadth over the last nine months, starting from a lower base. 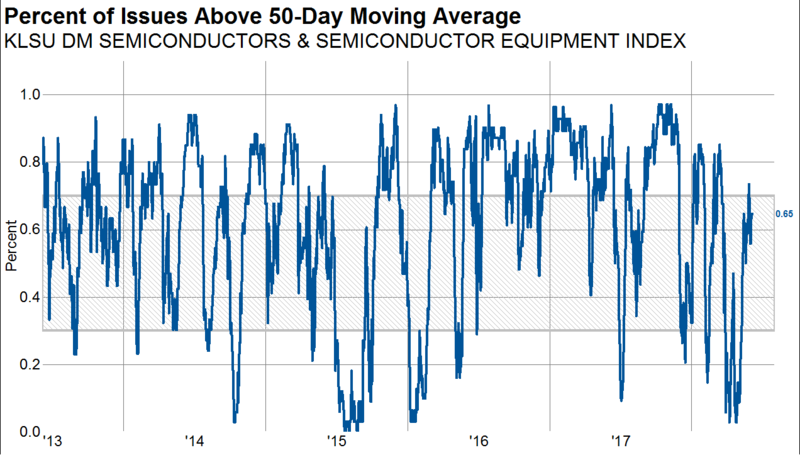 The percent of stocks above the 50-day moving average peaked last fall at about 85% and since has been sliding to the point that only 52% of the stocks are currently above the 50-day moving average. 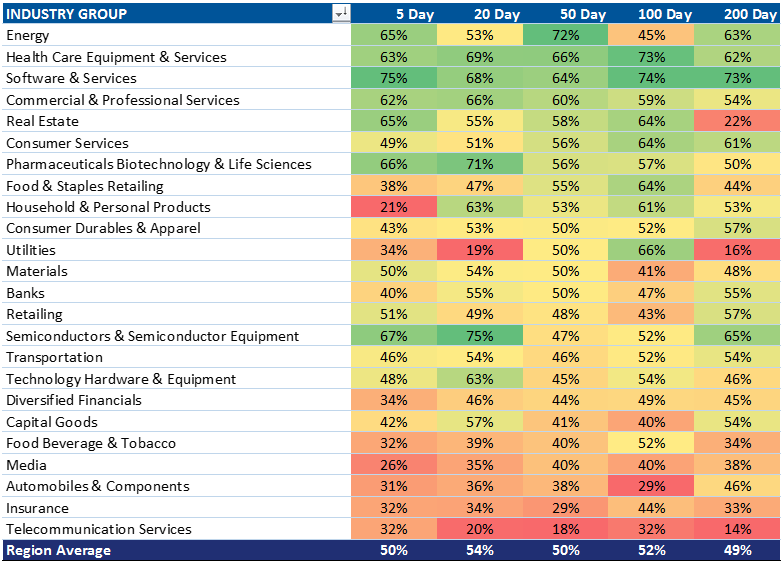 Internal thrust has been anemic relative to the DM stocks, with only 2% making a new 50-day high. 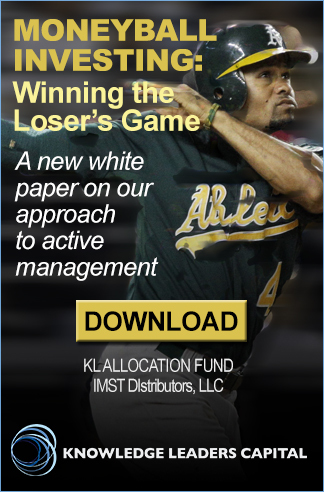 When I dig into the constituents of the DM semi/semi-cap equipment stocks another interesting anomaly appears. 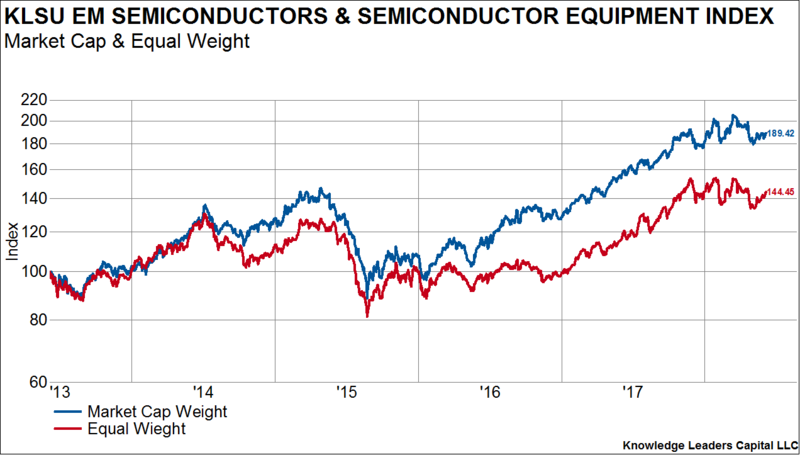 The semi/semi-cap equipment industry group is comprised of both semiconductor and semiconductor capital equipment stocks. 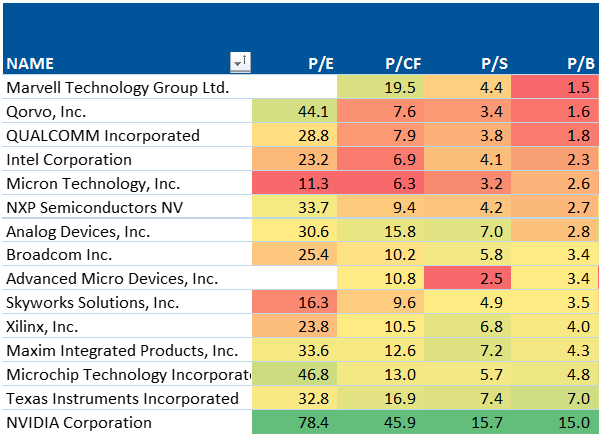 Focusing just on the semi-cap equipment stocks, there are few stocks advancing, but more down and down by a greater percentage. The distribution has a positive skew, meaning the median performance is better than the average. 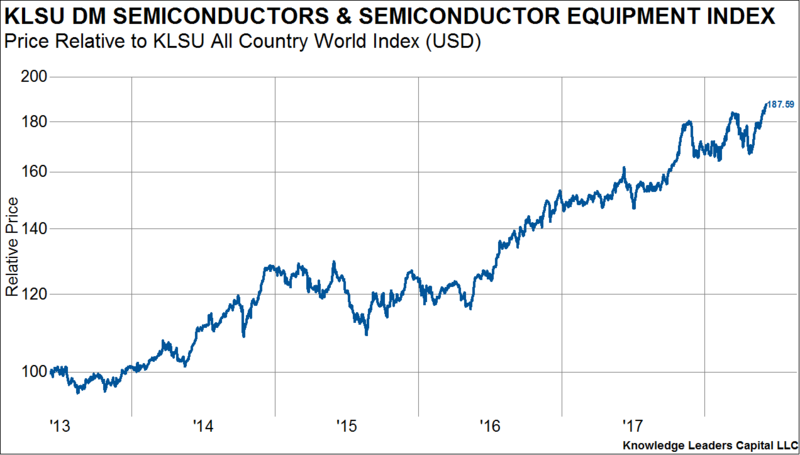 The semiconductor stocks (and there are many more) have more constituents that have logged gains over the last three months. And, the distribution of returns is negatively skewed, meaning the median performance is worse than the mean. Trends among the developed market semi/semi-cap equipment stocks are better than those in the emerging markets. In both regions breadth has deteriorated while prices have kept rising, a classic non-confirmation. Thrust has been weak lately too. 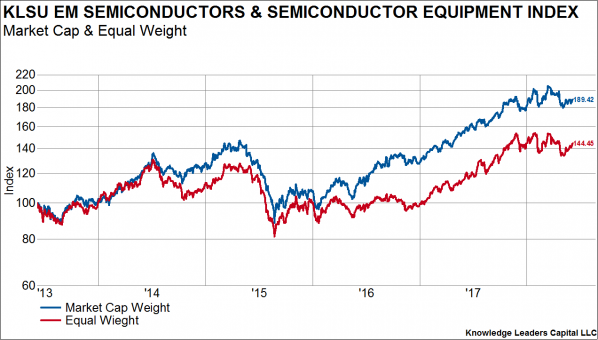 Semiconductors have fared considerably better than semi-cap equipment stocks. 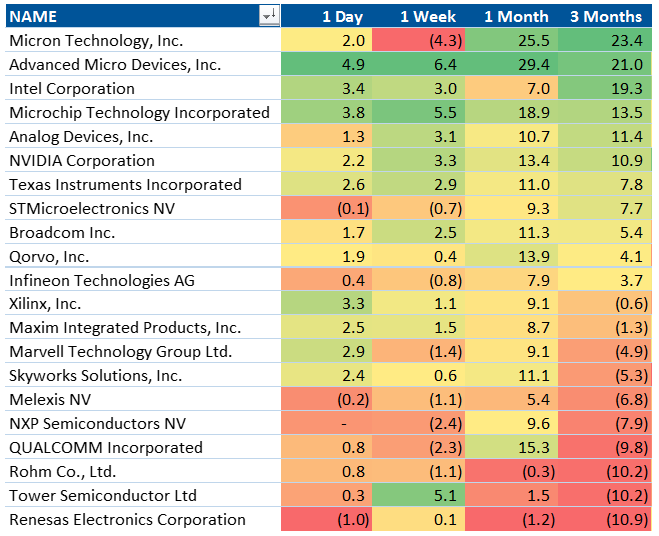 The best performing semi stocks over the last three months in the US are dominated by value stocks—not growth stocks (Micron, AMD, Intel). 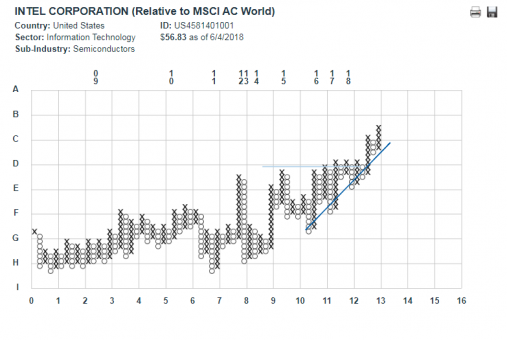 If there is one stock that stands out to me, it is Intel. At 6.9x intangible adjusted cash flow and 2.3x intangible adjusted book value, it is one of the cheaper semis in the world. 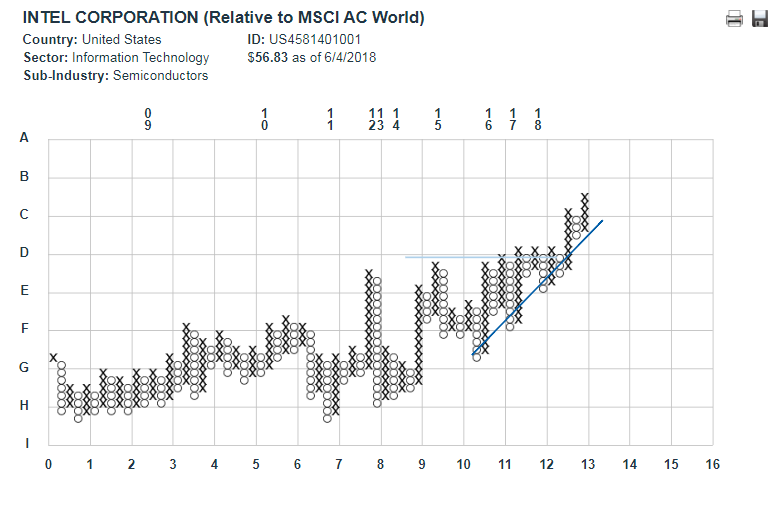 Its technicals also look great, with the stock breaking out of a multi-year relative performance base, making new highs. 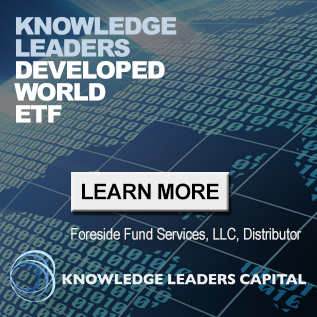 As of 3/31/18, the following stocks were held in the Knowledge Leaders Strategy: Intel, Analog Devices, Lam Research, ASML Holding NV, Micron Technology, Microchip Technology, NVIDIA, Qorvo, Xilinx, QUALCOMM, Renesas Electronics and Tower Semiconductor.